Publishing Your Dissertation Online: What’s a New PhD to Do? Is the Australian Resale Royalty Scheme Benefiting Indigenous Artists? 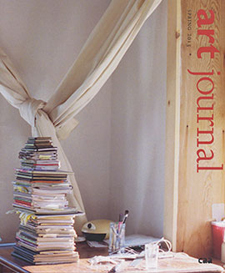 The new issue of Art Journal, which features Burn the Diaries, an artist’s project by Moyra Davey, is the first in the editorship of Lane Relyea. Essays consider topics such as role of the art critic in the emerging art market of China ca. 1990, the 1970s Tee Pee Video Space Troupe of the artist Shirley Clarke, obscurity and stillness in current film-based installations, and ethnicity in Marcel’s Duchamp’s gender-bending alter ego, Rrose Sélavy. An essay by Michael Jay McClure on the work of Trisha Donnelly, titled “If It Need Be Termed Surrender,” has been published as free content on the Art Journal website, along with Maymanah Farat’s review of the exhibition and publication The Fertile Crescent. Americans for the Arts sent the following email on July 23, 2013. Today, the US House of Representatives Interior Appropriations Subcommittee approved its initial FY 2014 funding legislation, which includes a proposed cut of $71 million to the National Endowment for the Arts (NEA). This would bring funding of the NEA down to $75 million, a level not seen since 1974! This is just the first step in an annual appropriations process, which this year appears to be heading toward a dysfunctional ending. It is expected that the full House Appropriations Committee will consider this legislation next week; however, as the Senate and the House have vastly different appropriations levels, it remains unclear whether this bill will reach the House floor or a final version will ever be completed with the Senate. A message from you now registering your concerns with your member of Congress would be well-timed to arrive prior to any possible next step in the appropriations process. Please help us continue this important work by becoming an official member of the Arts Action Fund. If you are not already a member, you can play your part by joining the Arts Action Fund today—it’s free and easy to join. In its regular roundup of obituaries, CAA recognizes the lives and achievements of the following artists, photographers, scholars, architects, educators, museum directors, and others whose work has significantly influenced the visual arts. Notable deaths this summer include the artist Sarah Charlesworth and the former Museum of Modern Art director John Hightower. In addition, CAA has published a special obituary on Jens T. Wollesen, a historian of the art of medieval Italy and Cyprus who taught at the University of Toronto for many years. The League of American Orchestras has circulated a statement that the National Endowment for the Arts (NEA) will be using in response to press inquiries. If enacted, the FY2014 budget proposed for the National Endowment for the Arts in the draft appropriations bill would severely hamper the agency’s ability to fulfill its mission of investing in arts organizations throughout all 50 states. As the President, Congress, and the American people continue to be focused on the country’s economy, it is important to note that a dollar invested by the NEA is matched by $9 of additional investment and generates $26 in economic activity. Last year, the NEA invested nearly $116 million through more than 2,200 grants in communities of all sizes. In turn, these nonprofit arts organizations had direct expenditures of $31.2 billion that helped support the 5.7 million arts-related jobs and 2 million working artists in this country. The President’s FY2014 budget request recognizes the importance of this investment and lays out a strong case for funding the NEA at $154.5 million, which the full House and the Senate will review as the budget process continues. The National Humanities Alliance (NHA) sent the following email on July 22, 2013. The House of Representatives Appropriations Committee released its FY 2014 Interior and Environment Appropriations bill this morning with a 49 percent ($71 million) cut for the National Endowment for the Humanities. If enacted, this funding level would devastate an agency that has already been reduced by 19 percent since 2010. This drastic cut would end programs that provide critical support for humanities teaching, preservation, public programming, and research, and result in positive impacts on every community in the country. Programs supported by the NEH teach essential skills and habits including reading, writing, critical thinking, and effective communication that are crucial for ensuring that each individual has the opportunity to learn and become a productive member of society. Further, NEH’s programs strengthen communities by promoting understanding of our common ideals, enduring civic values, and shared cultural heritage. Click here to send a message today to urge your Representative to vote against these devastating cuts. The NEH desperately needs your help. The National Humanities Alliance (NHA) sent the following email on July 19, 2013. Over the last three years the budget of the National Historical Publications and Records Commission (NHPRC), an agency critical to preserving America’s documentary heritage, has been cut from $13 million to just $4.75 million. Last week, the House of Representatives proposed another 36 percent reduction that threatens to further erode this small agency’s capacity to preserve endangered collections and provide access to our shared cultural heritage. Your voice can help to ensure that the Senate acts to prevent this draconian cut. The Senate will begin voting on NHPRC funding on Tuesday, July 23, so your senators must hear from as many of their constituents as possible before that date in order to prevent this reduction. 1) Click the link below to send a message urging your senators to provide full funding to the National Historical Publications and Records Administration. We have provided a template letter that you may customize if you choose, so it is quick and easy. 2) Share this message with your friends. The National Historical Publications and Records Administration (NHPRC) provides critical support for preservation of at-risk collections in communities around the country. Its grants leverage state, local, institutional, foundation, and other private funding by requiring 50 percent cost sharing—i.e. for every federal dollar invested, another dollar is spent from a non-federal source. NHPRC also supports publications projects of national significance such as the Papers of Abraham Lincoln and the Papers of George Washington. Just this year, it launched Founders Online, an unprecedented resource that provides online access to more than 100,000 documents of the founding generation. It is critical that you act now to ensure that efforts to preserve and provide public access to national treasures can continue. Once these materials are lost, they are lost forever. 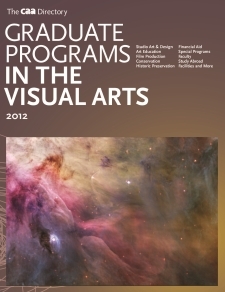 For the first time, CAA is offering advertising space in its annual directories of graduate programs in the arts. Promote your institution, program, product, or service in the go-to resource for prospective graduate students in the arts. CAA’s directories are the most comprehensive resources available for new and incoming graduate students in fine art and design, art and architectural history, curatorial and museum studies, arts administration, art education, film production, conservation, and more in the United States, Canada, the United Kingdom, Australia, and New Zealand. The directories provide prospective graduate students with the critical information they need to complete the application process and navigate the academic landscape, from availability of financial aid and fellowships to faculty and deadlines.